I have been seeing a lot of signs that my love ones are around me lately. One of the most comforting is seeing the cardinal when it comes around. I knew I wanted to create a card with the cardinal in the theme. I used the retired Woodland Textured Embossing Folder then stamped the bird from the retired Among the Branches. I die cut a heart and then corner rounded the corners. 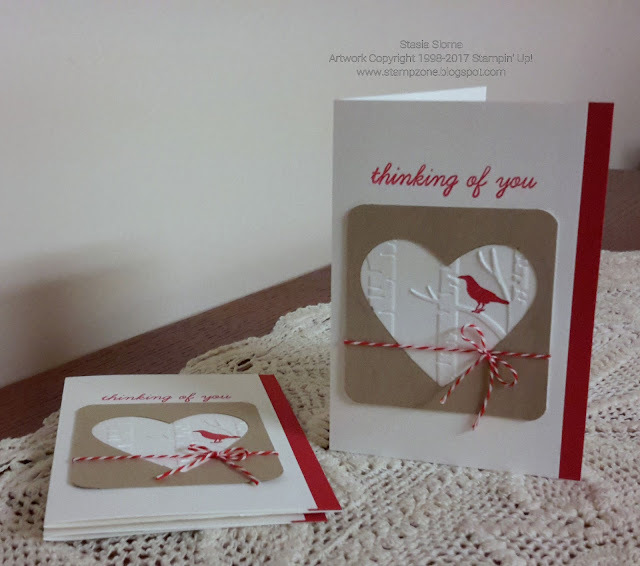 Tied some twine and stamped the thinking of you from the Art thinking of you stamp set. I love the simple simplicity of this card.